Academy Award-winning actress Lupita Nyong'o, star of 12 Years a Slave, has been this year's "it girl" in Hollywood in the weeks of award season, feted for her looks and fashion. But about a week before she won the Oscar for best supporting actress, Essence honored her at its Black Women in Hollywood luncheon--and her acceptance speech, less than five minutes long, turned her image as a confident woman of color inside-out. I remember a time when I too felt unbeautiful. I put on the TV and only saw pale skin. I got teased and taunted about my night-shaded skin. And my one prayer to God, the miracle worker, was that I would wake up lighter-skinned. The morning would come and I would be so excited about seeing my new skin that I would refuse to look down at myself until I was in front of a mirror because I wanted to see my fair face first. And every day I experienced the same disappointment of being just as dark as I had been the day before. She describes seeing her own role models growing up: Model Alex Wek, Oprah, the women in the movie The Color Purple. And through the course of the speech, she takes her listeners on her own struggle to understand her own beauty, a psychological struggle and an emotional one. Realizing in the end that beauty doesn't sustain you, she concludes, "What does sustain us... what is fundamentally beautiful is compassion for yourself and for those around you. That kind of beauty enflames the heart and enchants the soul. " Use your moment well: Awards acceptance speeches are typically loaded with platitudes, but in just under five minutes, Nyong'o got well beyond thanks and used her moment to make the audience think about the insecurity behind the "it girl" and how real girls today share those uncertainties about their beauty as black women. Her prepared text aided her in this mission, making sure the emotion of the moment and of her topic didn't derail her message. Share something of yourself: Anyone can get up and read slides, announcements, speeches. But what audiences hope for is to come away knowing something about you. The secret sauce of any speech is the one-of-a-kind person giving it, if only she'll let herself be seen. What Nyong'o shares in this speech is guaranteed original content, and that's catnip for any audience. Here, it resulted in a strong connection. Take advantage of the element of surprise: Awards luncheon audiences are hoping for something great, but expecting the usual speechifying. But with any audience, if you can guess what they're expecting and turn that on its head--in this case, addressing an event sponsored by a beauty magazine and talking about not feeling beautiful--you'll have their full attention. Surprise us a little more, fit in a little less. 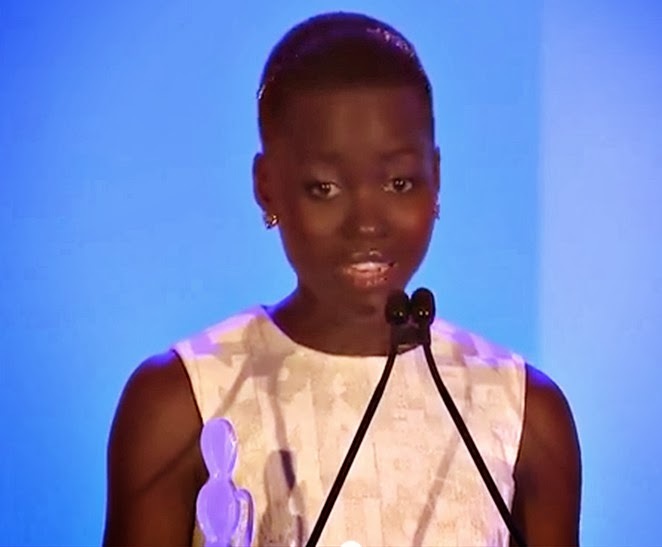 Nyong'o's speech went viral both after it was delivered and again after she won the Oscar. You can read the full text of this speech here and see the video below. What do you think of this famous speech? Seats are still available for my upcoming Oxford, UK, workshop on women and public speaking. Be The Eloquent Woman will take place on 2 April. The day-long workshop will help you build confidence and competence as a speaker, and help you subvert the expectations that many women face when they speak. I've also opened registration for another US session of this workshop, set for May 15 in Washington, DC. Please join me for these unique professional development sessions!